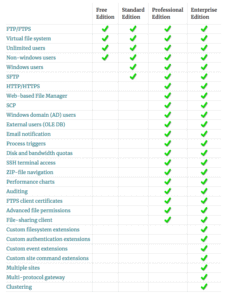 Like the name says, Complete FTP is a family of products that support FTP, FTPS, SFTP, HTTP, HTTPS and SCP. They basically support every file transfer protocol there is. From the Free Edition to the more Expensive Enterprise Level Edition, this product covers all needs. Out of all of the SFTP Servers, this has been rated as one of the most customizable SFTP Server for Windows. Authentications are made via an external database and/or .NET Extensions. You can also Authenticate via other FTP/SFTP server (multi-protocol gateway). With CompleteFTP SFTP Server you can allow/block clients by their IP Address or Host-Name and you can turn on auto-banning. 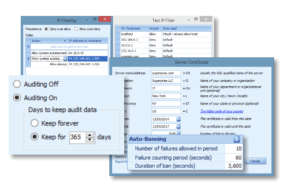 Reporting capabilities to see user activity and for Auditing purposes. Enterprise Level Features include clustering, customer authentication and events and so much more. CompleteFTP will run on most versions of Windows: Windows XP (needs Service Pack 3), Vista, Windows 7, Windows 8.x, Windows 10, Windows Server 2003, Server 2008, Server 2008 R2, Server 2012 and Server 2016. Both 32 bit and 64 bit versions of Windows are supported. Pricing varies from Free to $999 at the Enterprise Level.